Restorative justice is a set of principles and practices that create a different approach to dealing with crime and its impacts. Restorative justice practices work to address the dehumanization frequently experienced by people in the traditional criminal justice system. Instead of viewing a criminal act as simply a violation of a rule or statute, restorative justice sees this action as a violation of people and relationships. Restorative justice seeks to examine the harmful impact of a crime and then determines what can be done to repair that harm while holding the person who caused it accountable for his or her actions. Accountability for the offender means accepting responsibility and acting to repair the harm done. Outcomes seek to both repair the harm and address the reasons for the offense, while reducing the likelihood of re-offense. Rather than focusing on the punishment meted out, restorative justice measures results by how successfully the harm is repaired. Additionally, restorative justice seeks to include those most directly affected by a crime in the justice process, namely victims and survivors. Rather than a process focused on the offender, restorative justice focuses on those who have been harmed and the harms they have experienced. In the restorative justice process, victims are empowered to participate more fully than in the traditional system. Likewise, the community plays an important role in the restorative process by establishing standards of conduct, helping to hold an offender accountable, and providing support to the parties involved and opportunities to help repair the harm that has occurred. The opportunity to express the harm a victim has experienced, full participation in decision making, and support from the community all aid in the healing in the aftermath of a serious crime. Crime is a violation of people and relationships. Crime hurts individual victims, communities, and offenders and creates obligations to put things right. Restoration means repairing the harm done and rebuilding relationships in the community. Victims and the community are central to the justice process. All parties should be a part of the response to a crime—victim (if he or she chooses to be involved), community, and the offender. A primary focus of a justice process is to assist victims and address needs. The victim’s perspective is key to determining how to repair the harm resulting from the crime. The secondary focus is restoring the community to the degree possible. The offender has a personal responsibility to victims and to the community for wrongs committed. Parties involved in the restorative justice process share responsibility for repairing harm through partnerships for action. The community has a responsibility for the well-being of all its members, including both victims and offenders. All human beings have dignity and worth. Victim and offender are both able to move forward with respect, and dignity, and are re-integrated into the broader community as much as possible. Crime is a violation of the law and the state. Crime is a violation of people and relationships. Violations create guilt. Violations create obligations. Justice requires the state to determine blame (guilt) and impose pain (punishment). Justice involves victims, offenders and community members in an effort to put things right. Central focus: Offenders getting what they deserve. 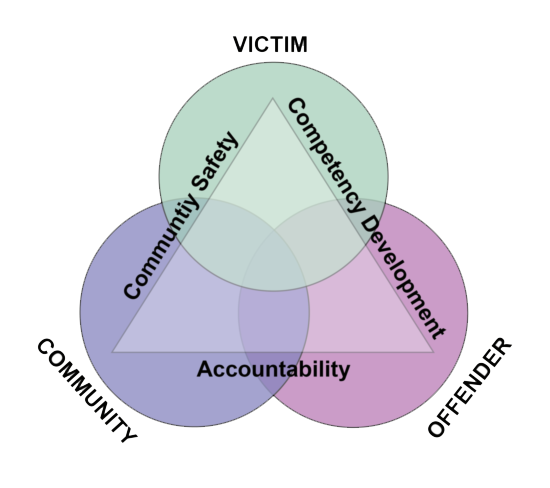 Central focus: Victim needs and offender responsibility for repairing harm. What laws have been broken? Who has been hurt? Who did it? What are their needs? What do they deserve? Whose obligations are these?